pH-drink® Bifido Active Lemon: the first prebiotic alkaline drink. New packaging and an improved recipe. Increases sense of well being. 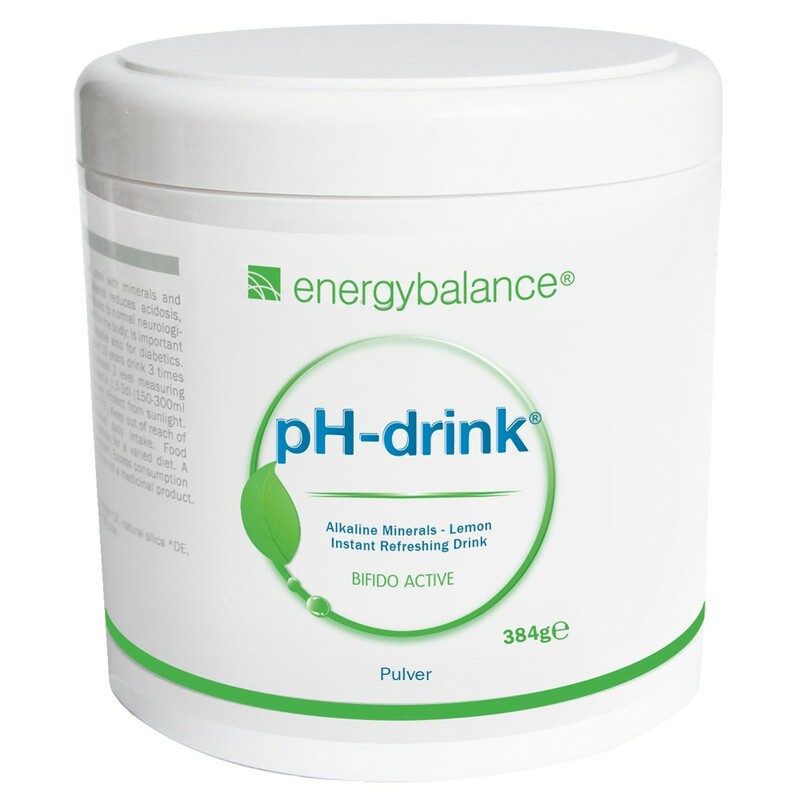 pH-drink® Bifido Active with natural mild lemon taste is a patented, low sodium, antacid, instant drink, rich in fiber and helps to regulate and maintain a healthy acid-base balance. pH-drink® Bifido Active contains certified organic agave inulin premium FOS (Fructooligosaccharide), which develops prebiotic activity when taken daily. This prebiotic activity stimulates the growth of good bacteria in the intestinal flora, so called bifidobacteria. Net weight 384g = 24 portions of 16g each. Low-sodium, rich in dietary fiber, 6.2g per day, bifidogenic (prebiotic), plant-based, lactose-free, gluten-free and suitable for diabetics. One 16g portion of Bifido Active Lemon = 24kcal/100kJ. Gives you an improved sense of well-being and activates the body's natural defenses. pH-drink™ Bifido Active Lemon contains the natural plant-based product inulin, which has a bifidogenic and prebiotic effect. Inulin stimulates the growth and activity of bifidus bacteria, which promote health. It also increases the body's ability to absorb calcium. Medical studies show that the bioavailability of calcium citrate is around 22% - 27% or 20% - 66% (depending on the study) higher than that of calcium carbonate. All of the minerals contained in pH-drink™ Bifido Active Lemon are more expensive organic mineral salts found in citric acid (citrate compounds). Average daily consumption of dietary fiber in Germany was still around 50g/day in 1945. According to the 2000 German Nutrition Report, today's average consumption of dietary fiber only comes to around 20g per day. According to the DACH reference values, this is considerably lower than the 30g/day recommended value for adults. A variety of positive effects are attributed to dietary fiber. Probiotic foodstuffs contain live bacteria that first need to make their way into the intestines to be beneficial. These beneficial bacteria include bifidobacteria and lactobacillus, which can primarily be found in dairy products. However, around 20% of the German population suffers from a latent lactose intolerance and needs to avoid dairy products. Inulin is made up of nondigestible dietary fiber and is considered prebiotic. Inulin is still undigested when it arrives in the colon where it is then decomposed. Inulin acts as a nutrient for bifidobacteria and supports their growth and activity. The beneficial bifidobacteria mostly use inulin and fructooligosaccharide to multiply. Regular consumption of pH-drink™ Bifido Active Lemon causes bifidobacteria to multiply significantly, stimulating the body's natural defense mechanisms and increasing your sense of well-being. Calcium plays one of the most important roles in balancing out acid-alkaline levels. Persistent acidity causes the body to extract alkaline calcium from the bones, especially at night, in order to balance out the acid-alkaline pool, which can cause osteoporosis (bone deterioration). Nutritional statistics indicate that people are not getting enough calcium. That makes optimal absorption of the calcium we do consume imperative. Bone build-up (calcium storage) stops at around age 35, at which point it begins to slowly lessen. Initial scientific studies on inulin and fructooligosaccharide show that consumption of these can increase the absorption of calcium, magnesium and iron by more than 20%. 1 to 3 times mix 2 measuring spoons levelled not to the brim 8g each (=16g) of pH-drink Bifido Active ¼ hour before a meal or bedtime in 150-200 ml (5-7 fl.oz) of still water (chlorine free) and drink on an empty stomach. Biologically certified agaveinulin min. 90% inulin (prebiotic oligofructose FOS fructooligosaccharides), biologically certified cane sugar, lemon juice extract, concentrate of whole lemons, Calcium citrate, potassium carbonate, ascorbic acid, magnesium citrate, potassium citrate, natural silica (anti-caking agent), iron II, zinc and manganese citrates. 24 portions of 16g each = 384g instant alkaline powder containing inulin and natural lemon flavor.